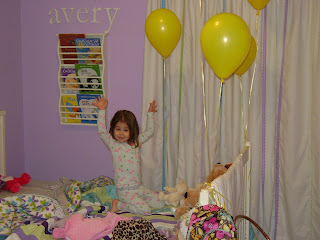 The night before Avery's birthday, after she had gone to sleep, Craig and I tied ten helium balloons around her room (yellow, of course!) 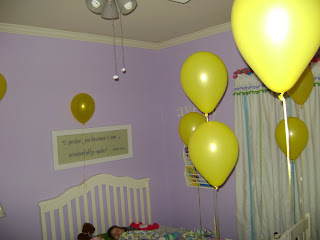 so when she woke up she would be surprised! When she came into my room, I expected her to be so excited and tell me about it immediately, but like her daddy, she doesn't show a lot of emotion! I had to ask, "Was there anything in your room when you woke up?" 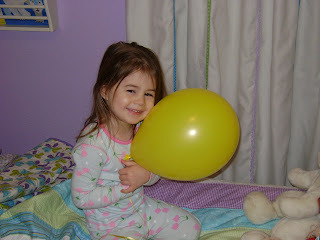 She said, "Yes, balloons!" She did love them, but I had to coax the excitement out of her! 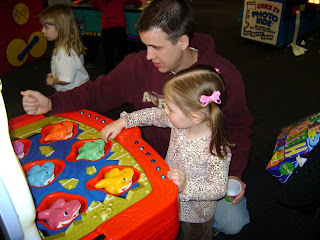 She had pancakes for breakfast with 3 yellow candles (somehow I didn't get a picture only video), took muffins to Sunday School to share with her friends, and then for dinner, we took her to Chuck E. Cheese! Not my idea of a great place to have dinner, but Avery loved it and that's all that mattered! She was so excited to see Chuck E. There is a robot thing of him by the stage area and she could not get that through her head that that wasn't the real Chuck E. who would walk around. 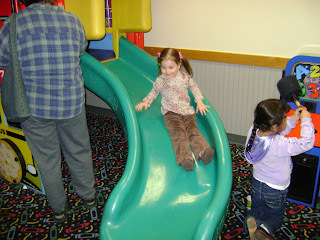 She kept calling to the robot, "HI, Chuck E. Cheese! HI!!" And she was waving and waving. It was hilarious. Finally the real one came out and was walking around and she ran right up to him to say hi. He held his arms out to give her a hug and she looked at Craig and stepped back. She decided she liked him, but didn't want to give him a hug, and didn't want to get too close. 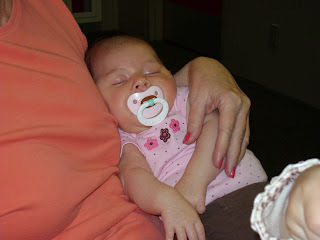 :) Bailey enjoyed it all since she got to sleep in Grandma's arms the whole time! It was a great day and I hope she felt special and loved! 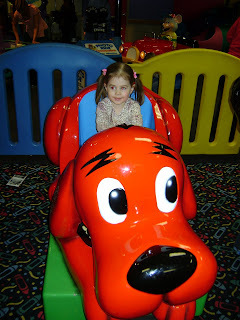 After next weekend, you can see pictures of her party at the playground, which is sure to be a blast since that's her favorite place to play!